GiveAshare.com is a gift company specializing in gifts of true, one share ownership in over 110 of the world's most beloved companies. The recipient becomes a legally registered shareholder of THEIR company entitling them to declared dividends, annual reports, and any other shareholder perks. 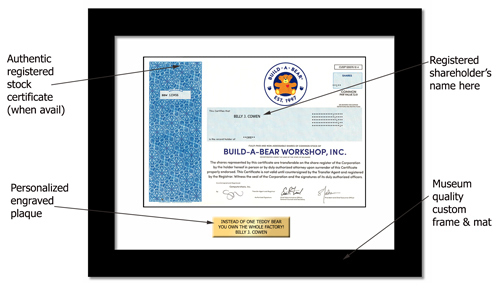 In addition, except for a few companies that no longer issue paper , the recipient can get the authentic registered stock certificate. We give you many ways to "GIFTize" your stock including frames, personalized engraved plaques and other fun items such as the I'm A Shareholder KIT and I Own Disney T-shirts. For kids, a stock gift has the added benefit of being a powerful teaching tool.